book . . . it sounded like a story children would enjoy, so I said,"Yes!" After reading it I am certain adults are going to enjoy it as well! I love the illustrations - children will enjoy the detail - there are so many things to see! Characters children will love and be surprised by! Story gives grandparents and parents so much to talk about with their grandchildren/children - giving to others, not judging others by looks, caring about all others, and what really matters! 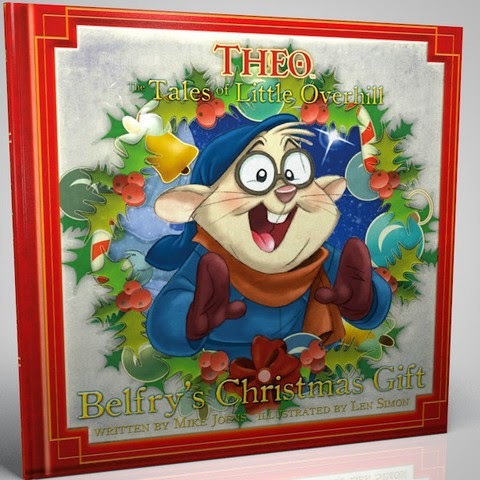 Whitestone Media has this to say about Belfry's Christmas Gift, "In this heartwarming Christmas story from Theo's Tales of Little Overhill, Belfry must think of something to give Theo at the Christmas party. He soon discovers the best gifts are not those wrapped in ribbons and bows. Belfry's gift is one which changes the life of a gruff and lonely clockmaker, someone shunned by all of the village animals. It is the gift of love!" I couldn't agree more! Belfry's Christmas Gift is a delight and a "gift" well worth sharing with those you love! Children will be able to identify with Belfry's dilemma - he is a little mouse and does not have money to buy a Christmas gift for Theo. While trying to find a gift, he becomes involved in showing love to a lonely clockmaker and in so doing changes the clockmaker's outlook and life reminding us all what we do to touch the lives of others and share Jesus' love with them is what really matters! Belfry's Christmas Gift would make a wonderful gift - and the perfect book to start a family tradition with by reading it each year at Christmastime to help us all remember to focus on what really matters - maybe reading it at Thanksgiving would be a great time to do this! I'm extremely happy Whitestone Media sent one copy of Belfry's Christmas Gift for me to review and an additional one for me to give-away (USA only)! If you are over the age of 18 and would like to be in the drawing for Belfry's Christmas Gift, which will be on November 20, 2014, please comment below to let me know the best gift you have received - for me there are a couple things - when my children were young, one year they drew and colored self-portraits, which I have hanging on my wall! Plus, Josiah wrote and illustrated a book for me - Super Josiah Saves Grandma from all the Robot Spiders in History! These three things make my heart happy! In addition, you will receive additional entries if you have followed on Google+, Google Friend Connect, followed by liking on facebook with the tab at this link (not just liking the post) and/or have followed grandma's cookie jar by email. For each of these which you have done you will receive one entry. In addition, if you "share" this post, you'll receive an additional entry (please let me know if you share). This will help me be able to draw names from among people who would like to win Belfry's Christmas Gift and it gives you several ways to enter the give-away! My favorite gift was when my husband surprised me with a ring and asked me to marry him. My most memorable gift (I have many bests) is when my husband gave me a portable air compressor!! He did it so I could have one at the church to make my job easier!! I definitely surprised, but I love it and use it all the time! Our 1st year as a young married couple, my husband surpassed me with a washer and dryer. It was the perfect gift (and one I wasn't expecting because I didn't think we could afford it) because we had been having to take our laundry to our parents' home each week so this made us able to do our laundry at home in the evenings. This set of machines lasted us over 30 years! The best gift I received was an iPhone. My best gift was a necklace from my husband. I love it, and him.